Friendship is a million little things. Like sending a card to let someone know what they mean to you. And adding butterflies to the mix just brings a smile! Celebrate Friendship with the Beauty Abounds stamp set and coordinating Butterfly Beauty Thinlits Dies found in the Stampin' Up! 2019 Occasions Catalog. The Beauty Abounds Bundle will be featured in my March 2019 newsletter which will hit e mail in boxes at 9:00 am (MST) on March 5. Get your own copy by adding your name to my mailing list by 8:00 am (MST) on March 5, 2019. Cards made using Animal Expedition Designer Series Paper are not only quick and easy but are sure to bring a smile! For both cards, I let the designer paper do the work. The greeting is from the coordinating stamp set Animal Outing. Add a unique look to your creations using the Faux Postage Technique. Use a template/mask to create individual blocks of faux postage stamps. This project uses Waterfront stamp set, and also includes the Clear-block Watercolor Background Technique. My February Fresh Card Making Tutorial will feature this technique. This tutorial will hit e mail inboxes at 9:00 am (MST) on February 19, 2019. Please add your name to my mailing list by 8:00 am (MST) on February 19 to receive this tutorial complete with step-by-step color photographs in a pdf format. This tutorial will also include the Faux Postage template which can be printed on regular copy paper for future use. Once the sign up process has been completed, you'll receive my Adhesives 101 tutorial via email in pdf format as my gift to you. More fun product to choose from for every $50 spent February 15-March 31. Be sure to check out the Painted Seasons stamp set, Painted Seasons Designer Series Paper and coordinating Four Seasons Framelits Dies. The stamp set and DSP are one of the 2nd release Sale-A-Bration choices (free with $100.00 purchase). The framelits dies (#150074, $28.00) can be purchased separately March 1-31. Now's the time to stock up on stamps, paper, ink, and accessories! Buffalo Check has become one of my favorite of Stampin' Up! 's big background stamps. The color possibilities are endless. Switch up the colors, and you've got a great background for holiday or masculine-themed cards. For these card, my color was Flirty Flamingo stamped on Whisper White card stock. I drew the horizontal and vertical lines using a ruler and black Stampin' Write Marker. The lines just add a little extra pop. I stamped the full image of the background stamp, then cut it down to create these two cards. I would suggest using the Stamparatus for these big background stamps. It is unlikely that you'll get a good stamped image the first time around. The Stamparatus will allow you to add more layers of ink, getting a good stamped image this is perfectly lined up with each stamping. These fun little cards were created using parts of the Be Mine Paper Pumpkin kit for January. 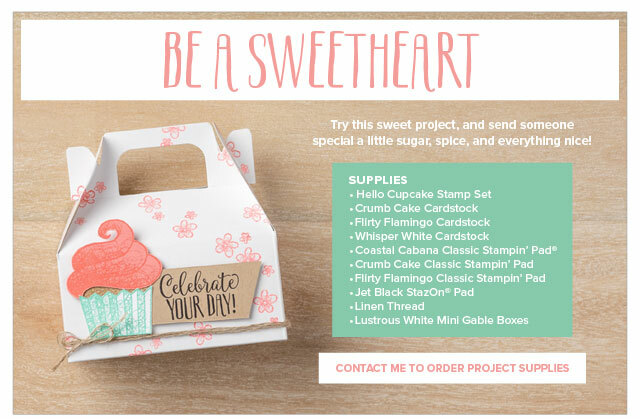 The kit included pouches to put treats in which would be great for kids to bring Valentine's Day cards to their classmates. But, I wanted cards I could put in the mail. So I cut down the pouches (the Melon Mambo and white hearts pattern) and used them as card fronts. The chameleons, kangeroo, Pool Party hearts and circles, plus the Melon Mambo hearts were all pop-outs included in the kit. The greetings and heart embellishments were also found in the kit. All I had to do was add the pieces to Lemon Lime Twist or Petal Pink card bases. So versatile, and this were truly a 5 minute or less project! Have you checked out My Paper Pumpkin? With Stampin' Up! 's hassle free monthly crafting subscription, you get a box full of all the supplies needed to create fun cards or 3D projects. This includes an exclusive stamp set, ink, paper, embellishments, Dimensionals, and or Glue Dots. Crafting could not be easier! This is the Valentine's Day card I made for our 2 year-old granddaughter. She loves zoo animals, but she is especially fond of giraffes. The giraffe image in the stamp set Animal Outing is perfect for her! 1. The embossed background is made using the Animal Friends Framelits die. Normally when using this die, you would cut the design from the paper. To emboss instead, you'll need to use the Big Shot Embossing Mats. -Emboss the background on a piece of Crumb Cake card stock using this sandwich: platform on Tab 1, standard cutting pad, blue mat, card stock, framelit placed down, white embossing pad. You'll need to reposition the framelit three or four times to fully emboss the card front. 2. Cut the center of the card front out using the Big Shot and hearts framelits die or a punch. 3. Place scrap piece of Whisper White card stock into the Stamparatus. Place the giraffe image rubber side down on the card stock. Close the hinged plate, picking up the stamp. Ink with Early Espresso and stamp. Repeat as needed to get a good stamped image. Do the same with the leaves/frog image. 4. Color the giraffe using Blender Pens, water color pencils or Stampin' Write Markers. Do the same for the leaf images. I used my Stampin' Blends. 5. Cut the giraffe and leaves out using the Big Shot and coordinating Animal Friends Framelits Dies. 6. Cut a background piece slightly smaller than your embossed card front. For this card, my background came from Tranquil Tide Designer Series Paper. 7. Get an idea for the placement of the giraffe and leaves, leaving room for the greeting. Once you have a plan, place the background piece in the Stamparatus. Place the greeting rubber side down on the background. Close the hinged plate, picking up the stamp. Ink with Early Espresso and stamp. Repeat as needed to get a good stamped image. For this card, I used the greeting from A Little Wild. Animal Outing has a stamp with the same sentiment, "Wild About You," but it is a little too big for this project. 8. Cut out a border for the heart by nesting two heart framelits, one larger than the other, on a piece of Early Espresso card stock. Cut out using the Big Shot. Attach to card front using a small amount of Tombow Multi-purpose Glue. 9. Attach giraffe and leaves to the inside edge of the heart cut-out using a small amount of SNAIL adhesive. I trimmed off the frog image. 10. Attach card front to So Saffron card base using Dimensionals around the heart and on the 4 corners to pop it up. 11. Add enamel dots to complete. Stampin' Up has a great selection of big background stamps, perfect for adding detailed backgrounds to your projects. They are designed to cover a traditional A2 sized greeting card. But, you can also trim the images to use as accent pieces. Get your own copy by adding your name to my mailing list by 8:00 am (MST) on February 5 8.